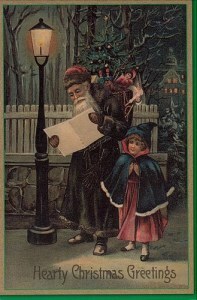 This card is from an original Color chromo-lithograph postcard, showing a classic Santa Claus. This cards were originally printed in Bavaria, Germany Circa 1900. Then, as now friends and loves one are always happy to find athoughful and hearty Chrimas Greetings in their mailbox from loved ones or cherished friends.